Maldives has established diplomatic relations with Central African Republic, a landlocked country located in Central Africa. 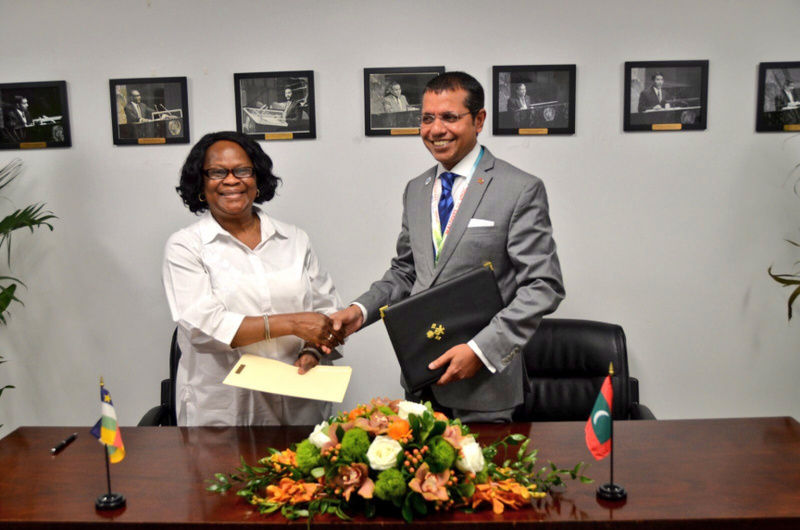 The joint communique was signed in New York, US, last Friday by Permanent Representative of Maldives to the United Nations, Dr. Ali Naseer Mohamed and Permanent Representative to CAR to the UN, Ambroisine Kpongo. The formalization of the diplomatic ties between Maldives and CAR brings the total number of countries Maldives has diplomatic ties with to 169. CAR, which has a population of approximately 4.6 million people, borders Chad, Sudan, South Sudan, Democratic Republic of Congo, and Cameroon. CAR, despite being rich in natural minerals and resources including uranium, crude oil, gold and diamonds, is listed as one of the poorest countries in the world. Maldives has worked together with CAR at the UN, before the eventual formalization of diplomatic ties between the two countries last Friday.